The core messages of Shambhala are basic goodness and enlightened society. At Shambhala Sun Day, we gather to connect with basic goodness and celebrate our society. Everyone is welcome, whether it is your first time in a Shambhala shrine room or whether you have been practicing for years. Please join us! 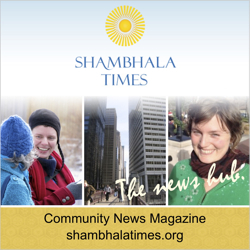 Shambhala Sun Day takes place on the first Sunday of each month, starting at 11am. Parts of the official activities are geared towards children. The first hour includes meditation, talking, listening, and even some singing. Then comes a social with tea, coffee, food, and good company from 12 to 1pm. Your involvement, comments, and feedback are most welcome—whether you want to help shape the future direction of the event, suggest a topic for discussion, participate in the ceremony, make flower arrangements, bake cookies, or even just complain about what went wrong.